iFrogz™ 100% silicone iPod™ cases are a three-component system that offers a wide variety of colors and styles so that you can be you. Customization is the ultimate expression of style. Discover the crystal clear optics of their Screenz covering. These Screenz offer the thickest protection for screen covering and also allow a chance for you to stand out with the wide range of styles to choose from for click-wheel decals. The Bandz offer extra side protection and a splash of color to individualize your iPod cover. Save on your next iFrogz purchase with iFrogz discounts, iFrogz promotions, iFrogz coupons and iFrogz savings from 58Coupons.com. Check out iFrogz.com and save 10% on everything in the store! Click link to view code. iFrogz.com is offering an additional 15% off items that have already been reduced. Click for Code. Check out iFrogz.com and you can get the #1 iPhone case on the market for just $29.99. Click link now. Just use this coupon code on iFrogz.com and you can save 15% off your order. Click link now. 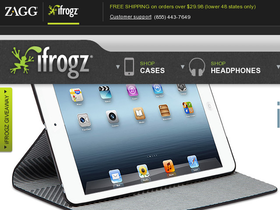 Don't miss out on the blowout sale going on now at iFrogz.com where you can find savings up to 65%. Click link to check it out.